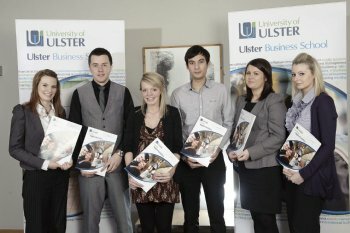 Six innovative students were recognised for their outstanding achievements at the Ulster Business School’s 2011 Placement Innovation Awards ceremony. Each received a prize for their contribution to driving innovation and excellence during their placement year. The innovative projects ranged from revamping training materials for a local council to designing and developing a sales management system for a multi-national IT company. The overall prize was jointly awarded to Simon Bradley, a BSc Hons Marketing student who completed his placement in Hartwell Plc, and Emma Drake, a BSc Hons Human Resource Management student who completed her placement with AllState NI. During the placement year Simon introduced a new real-time performance management platform for sales executives, which enabled the organisation to increase sales by over £1m. Speaking at the recent awards ceremony at the Jordanstown campus, Professor Marie McHugh, Dean of the Ulster Business School, said: “Through the very effective partnerships that we have established over the years with the business community, it is possible for us to provide the opportunity for over 300 students across the School to benefit from a one-year placement. Through placements, our students have a unique opportunity to develop a range of skills, which contribute much to their employability.